Enter the Bai Justin Timberlake Concert Getaway Sweepstakes now through September 30, 2018 at Drinkbai.com/JTSWEEPS for your chance to weekly prizes or win a VIP Trip for four (4) to Memphis, Tennessee to attend the Justin Timberlake concert on January 12, 2019 also chance to meed him. Visit this link:www.drinkbai.com/jtsweeps to go to the sweepstakes page. Enter 10-digit upc number found on any Bai product 11.5oz, 18oz, or 33.8oz to unlock the sweepstakes entry page. Follow the online instructions to register by entering all information requested on the registration form. Prizes: One grand prize winner will win trip for 4 to Memphis, Tennessee to attend the Justin Timberlake concert on January 12, 2019. Trip consist of round-trip first-class air transportation from a major airport nearest winner’s home to Memphis, car service to/from winner’s home and airport in hometown and to/from airport and hotel in Memphis, two (2) double-occupancy hotel-suite accommodations for two (2) nights, four (4) concert tickets, one (1) Memphis tour for winner and guests, and $500.00 in spending money and other exciting weekly prizes. 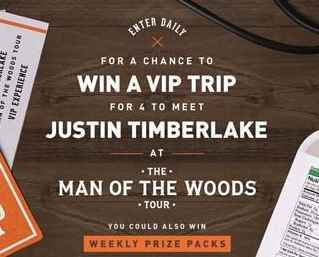 When To Enter: The Bai Justin Timberlake Concert Getaway Sweepstakes entry begins at 12:00:01 am Eastern Time (“ET”) June 01, 2018 and ends at 11:59:59 pm ET, September 30, 2018.